Visual Voicemail… it’s about time! One of the few (if only) things that have attracted me to the iPhone is the “Visual Voicemail” feature – the ability to see your collection of voicemails and play any message you wish. As someone who receives a lot of voicemail messages, this is not just desirable, it’s borderline critical. During our recent vacation, I received a phone call that I thought was from my wife at our condo. I missed the call, but wanted to see if she left a message and time was of the essence. Unfortunately, I had 9 voicemail messages that I needed to wade through first – and some of them were several minutes in length! Doesn’t it make sense to be able to simply play whatever message I like without having to listen to (or skip through) 8 other messages first? Absolutely… and it took Apple forcing this upon the network carrier before AT&T made their network function this way. Let’s get with it, folks. This is bone-headed, “duh” kinda stuff. Our old corporate Comdial phone system – installed in 1999 – had this capability with a simple desktop app. But most of our cell phones can’t do this 10 years later? Microsoft made a bit of a splash recently as they announced their new search (err… “decision”) engine, Bing. 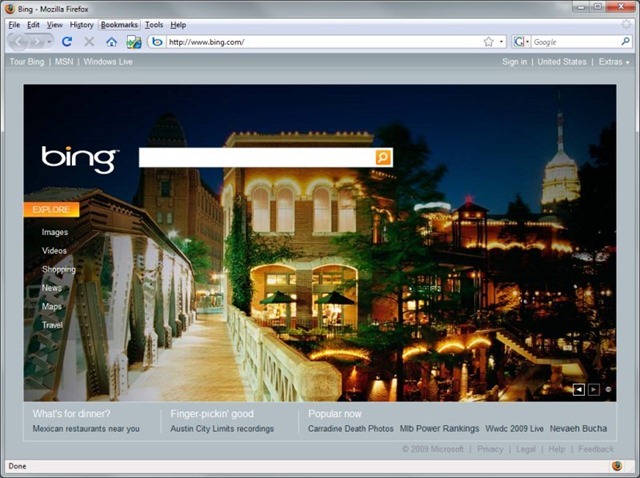 Thankfully, Bing isn’t just a re-brand of their previous Live Search engine. Rather, Bing appears to take the good of Live Search – a great home page, for instance, good search results, Cashback functionality – and it wraps them into what they are referring to as a “decision engine”. It sounds a bit like they’re giving up on the “search engine turf wars” that they’ve been losing to Google for years now by attempting to change the game entirely. It remains to be seen how effective this route is going to be, but I’m of the impression that this is the right track. Google is great and all – I use it quite a bit – but the results are less than perfect. They seem almost “bloated” at times with fake websites, old information, and stuff that I quite honestly don’t want. Can a new engine perform better? Perhaps. Link “previews” when you mouse over them. Nice! Video “previews” when you mouse over them. Great home/start page graphics with informational overlays. Cool! Cashback functionality, that I actually use. Seriously. I’ve been using Bing as my primary search engine for the past week or so, and I’m really enjoying the experience. Better yet, I’m finding very little need or desire to use Google, which is different from my previous attempts to use Live Search as my primary engine. One *very* interesting experiment is the “Blind Search” test from Michael Kordahi. 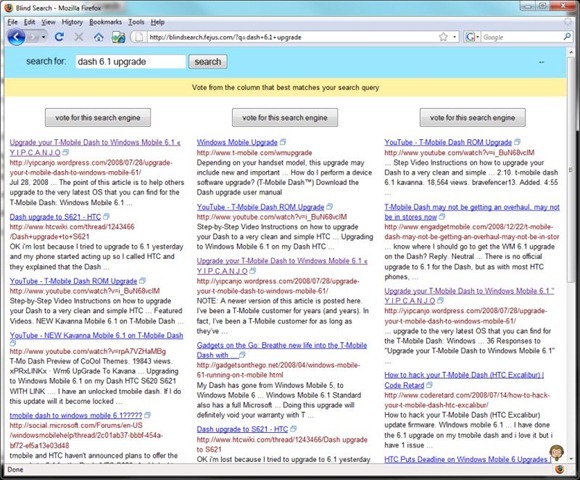 Essentially, this portal page allows you to enter any search term, hit the ‘search’ button, and receive back three “blind” columns of results – one each from Google, Yahoo, and Bing. You don’t know which results are which until you click on a “vote for this search engine” button, which unveils the identity of the engine you selected. In the (above) example, I selected the left-column, which were the results from Google. The initial roll-out of this “blind test” gave scores for each engine — showing which engine was selected most frequently — but it was clearly getting jacked somehow, and was thus removed for now. Still, for your own experimenting, it’s interesting to put in some search phrases and decide which engine delivers the best results to you and how frequently. In my case, I’ve ended up clicking the Google engine about 60% of the time. That said, it’s definitely made me think about “what” constitutes ‘better results’ from a search engine. Is it more than just the top ten ‘blue links’? What about the look and feel of the site? How about linking in other media – images, video, etc.? Quite honestly, sometimes it’s difficult to say – and the blind test really shows that. I would venture a guess that the search results from these top engines are all quite good these days, so having additional offerings – such as what Bing is proposing – might be the right direction. Anyhow, I’m really enjoying my Bing experience thus far. 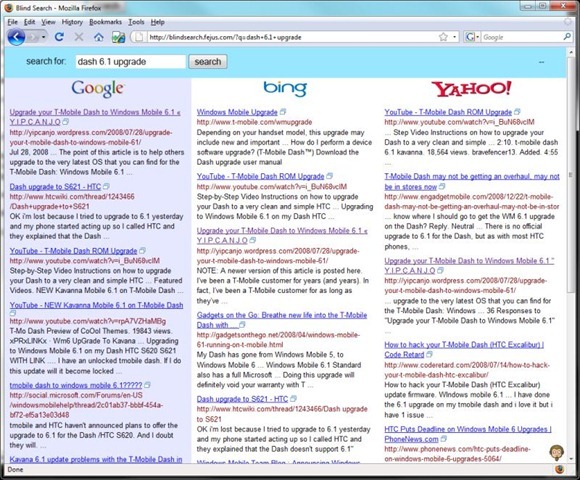 For some additional insight, check out Paul Thurott’s “Bing” review here.